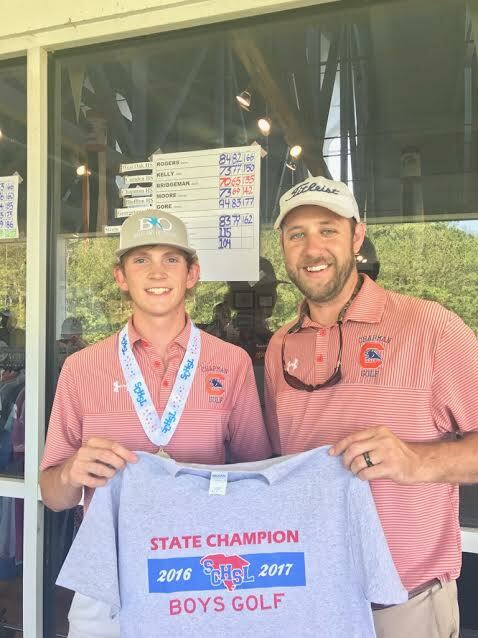 Jacob Bridgeman from Chapman and his coach Dustin Batson celebrate his state championship. Last year Jacob Bridgeman used the South Carolina AAA championship as a coming out party of sorts. The Chapman High School junior won the title in May and spent the summer winning more tournaments. This year Bridgeman has repeated as champion and did it by coming from off the pace to take the title by five shots. The future Clemson golfer shot a 2-under par 70 in the first round to trail Brandon McBride of May River by a shot, but knew he could do better in the final round. “I didn’t have my distances right in the first round,” said Bridgeman. “I had a practice round and the first round, but I knew I had to change some things in the second round,” he said. In the final round Bridgeman made the changes to put him in better position off the tee. He used drivers, hybrids and irons from the tee and had his distances dialed in. “It made a lot of difference. I was able to be in the right place to have a chance to hit it close and make some birdies,” he said. Bridgeman shot a final round 7-under par 65. His second day total included making a 30 foot putt for an eagle. The Chapman golfer finished at 135 and had a five shot margin over Golden who finished in second place. “Winning the title last year was great, but there is something about winning it for a second time. I think it makes it a little more special to know you could do it again,” said the AAA champion. Waccamaw repeated as AAA team champions. The Warriors finished in front of Bishop England and Gilbert. Upstate teams from Emerald 644, Palmetto 651, Pendleton 664, Woodruff 667 finished fourth through seventh respectively. The Cavaliers of Christ Church are state champions once again this year, but things are a little different. The Cavaliers moved up a classification from Class A to Class AA and the competition was a little stronger than when the team played in the smaller classification. Ninety Six held the first round lead over St Joseph’s of Greenville. Christ Church was 11-shots off the pace behind the AAA tournament leader. In the final round the Cavaliers got great production from some of their very young players. Jack Wofford, who is not in high school, but is just an eighth grader can play with the team as an 8th grader) shot a 70 to finish in a tenth place tie. St Joseph’s won a playoff for second place and their golfer, Sean Miller finished as the tournament runner-up just two- shots behind the champion James May from Ninety Six. Harry Reynolds of Christ Church tied for fourth place while his younger brother Rafe finished in eighth place. Christ Church now has won 17 state titles in golf. Only A.C. Flora which has just won its 15th championship are in the same category. Flora was third after the first round of the South Carolina AAAA championship at the True Blue Golf Club on Pawleys Island. Wren held the lead and Myrtle Beach was second, but you don’t win seven straight titles and 14 championships in the school’s history without being able to close out a tournament. The Falcons shot a final round 291 to go with their first round 301 total to finish at 592 and a 10 shot victory. Myrtle Beach was second and the first round leaders from Wren finished in third place. Myrtle Beach’s Holden Grigg set a course record with two rounds of 65 for a 130 total and an 11 shot victory margin over Flora’s Jack Parrott. Travelers Rest golfer Levi Moody earned All-State honors with a sixth place finish in the championship.